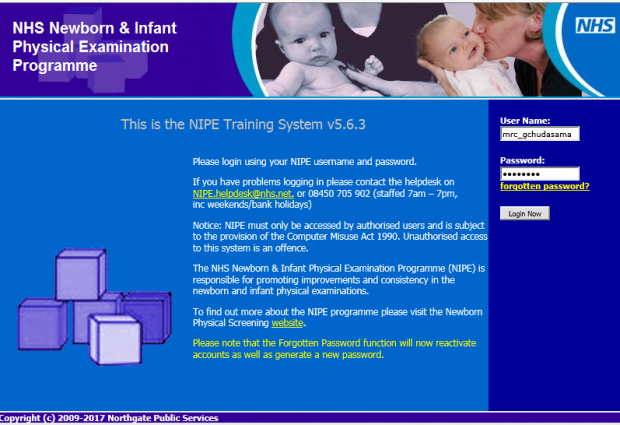 More than 80% of trusts in England are now using the NIPE SMART IT system for recording information relating to the NHS Newborn and Infant Physical Examination (NIPE). We (the NIPE team) are now concentrating on helping users get the best out of the system. We’re supporting superusers and NIPE leads to use its most important functions including reporting, recording screening outcomes and failsafe tracking. Superusers are staff who have extra permissions on the system to do things like running reports, merging records and managing users. Last year, trusts were invited to contact us with requests for help. We tailored the support we provided to meet their individual needs and we really enjoyed visiting many trusts. Other trusts only required help by phone or email, or benefited from a virtual demonstration of the system. Despite the fact that the national NIPE team is smaller now than 2 years ago when implementation was at its peak, we’ve managed to undertake 30 support visits. We’re still receiving requests for support and are working hard to accommodate them. We tried to include most of these topics in the NIPE SMART user guide published in January 2017. Some users at the visits were not aware the guide was available, so please do access it via the NIPE SMART system or contact us if you’d like to be sent a copy. We’re running regional NIPE events this month. These include an update from the national programme and overview of some of the most frequently asked questions covered in the SMART user guide. We still have places at a few events – so book a place if you’d like to go. Note that the Manchester event has now been re-scheduled for 19 July. We love getting feedback from you all. Here are a few comments received about the support visits. Thanks very much for coming today. You helped me very much, and gave me many ideas about how to improve our data quality, and to get more out of NIPE SMART. Thank you very much for coming to visit us yesterday, we all found it invaluable. Thank you for your encouragement, our superuser is doing a great job ‘cleaning’ our system and it was good to learn so many new tips for utilising the system more effectively. I have no doubt our superuser will be more confident with her new role as a result of your time. Contact us and let us know what you think via the screening helpdesk.